This year, two of my favorite writers are publishing new books. 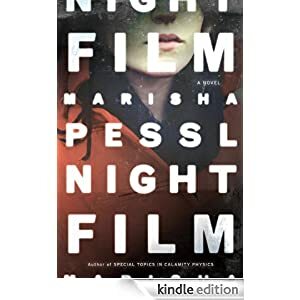 In October, Donna Tartt’s The Goldfinch will be released, and in August, Marisha Pessl’s Night Film hits the shelves. I was lucky enough to score an electronic copy of the ARC of Night Film from NetGalley, and oh, people, let me tell you: it’s terrific. A veteran investigative journalist, Scott McGrath, is drawn to investigate the alleged suicide of Ashley Cordova, the daughter of a famous cult-film director named Stanislas Cordova. Years before Ashley’s death, McGrath had been investigating the elder Cordova, a recluse whose films explored the darkest human impulses. After receiving an anonymous phone call with a tip about some of Cordova’s darkest acts, McGrath threatens to expose the director, but eventually finds the tables turned when he’s sued for libel and loses everything, including his marriage. Still convinced of Cordova’s guilt, McGrath sets out to take revenge on the director by trying to prove that Ashley’s death was no accident. Along the way, McGrath teams up with Nora, a young wannabe actress from Florida, and Hopper, a handsome lone-wolf drug dealer, each of whom are also drawn to investigate Ashley’s death for their own reasons. I wouldn’t even begin to try and untangle the complicated plot for you, mainly because I wouldn’t want to ruin any of the fun. This novel could easily be termed Hitchcockian, with all the twists and sleights it has at its disposal. I have no doubt that we’ll see the usual too-cool-for-school, “Yawn, I had this figured out from page X” reviews. Ignore them. As much as I hate to use the tired term gripping, that’s exactly what this book is. Even if you think you have it figured out (I did, several times, and I was wrong, wrong, and wrong again)—even if you do figure it out—the ride is too much fun. One thing I enjoyed about this book and Pessl’s first book was that she is so at ease as a storyteller. Some authors who write books with complicated plots cannot seem to get out of their own way; they act less like storytellers and more like annoying tour guides who want to make sure you see how clever they are. And even though the book includes “actual” web sites and news articles (which, I’ll admit, don’t work so well on Kindle, but might be terrific on an iPad), these never seem gimmicky like they might in a weaker book or in the hands of a less assured author. Pessl does a terrific job of getting out of the way of her characters and her plot, which means as readers, we are right there with them. She also creates a terrifically noir atmosphere. And frankly, here’s the best part: I know what happens, and I still want to read it again. When I finished reading Special Topics in Calamity Physics for the first time, I immediately turned back to the first page and started the book again. I’ve pre-ordered my hardback copy of Night Film, and when it arrives I’ll be cracking it open and enjoying all the terror and thrill of reading it a second time. The best books, like the best movies, never lose their suspense and surprise, even if you know what happens. I am ever so excited to read this book! It has clearly been too long since Marisha Pessl wrote a book, and I am soooo excited about her new one. Thanks for sharing!! Sounds amazing and I cannot wait to read it too! Jenny, I hope you enjoy it! I always worry a bit when an author I love has a new book out, but Pessl did not disappoint! Jen, I hope you will like it! I think you might like the one I am reading now, too: Rage Against the Dying. I’ve always meant to read Special Topics, but haven’t yet. But this book sounds even more intriguing and I’m attracted to the noir sound of it. Christy, they are very different books, although they each have a dark edge. She’s a terrific writer and I’d say thematically/stylistically a cross between Donna Tartt and Gillian Flynn.